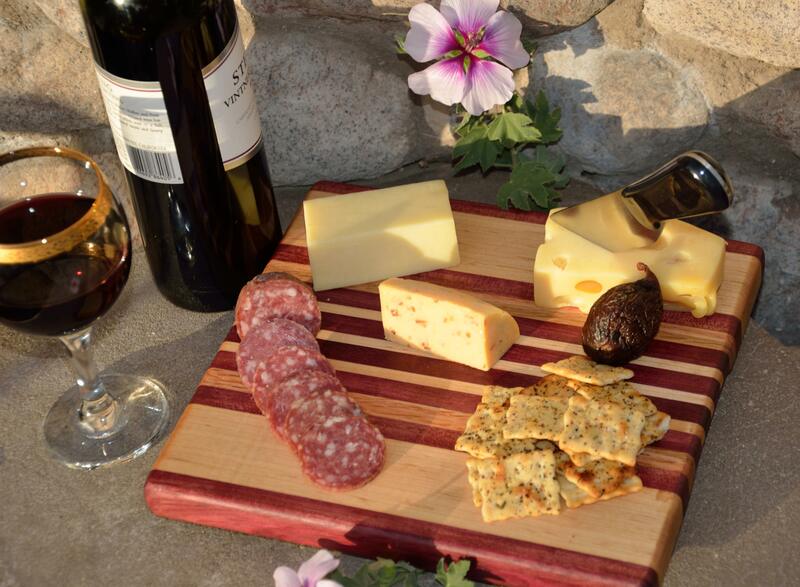 Cheese boards become the center piece of many fine dinners in our home. A few cheeses, some crackers, some summer salami and a few olives … exquisite. In my view, cheese boards are too light weight to be used as cutting boards … though there’s nothing wrong with using a small board like these to slice a tomato or quarter a lime. On the other hand, however, some of these small boards do include “ring porous” woods that I don’t recommend for cutting boards: oak and hickory. But, to each their own. There’s nothing inherently wrong with using these boards for cutting … but I would suggest you grab some cheese and enjoy a nice leisurely meal. Your mileage may vary. All of the boards that I create have routed finger holds and non skid rubber feet held on with stainless steel screws for long life. Prices vary with the size of the board, the woods selected, and the complexity of the construction. As shown, these boards cost $30 – $60. # 14-46. Black Walnut, Hard Maple and Yellowheart. 8″ x 10″ x 1″. # 14-49. Black Walnut, Padauk and Hard Maple. 8″ x 11″ x 1″. # 14-41. Black Walnut. Approximately 10″ x 12″ x 1″. # 15-001. Black Walnut, Red Oak, Purpleheart, Hard Maple and Cherry. 11″ x 9″ x 1″. # 14-63. Hard Maple, Teak, Yellowheart and Black Walnut. 9″ x 11″ x 1″. # 14-61. Black Walnut, Cherry, Yellowheart and Hard Maple. 12″ x 11″ x 1-1/4″. # 14-58. Black Walnut, Hard Maple, Yellowheart and Honey Locust. 11″ x 12″ x 1″. # 14-57. Black Walnut, Hard Maple, Padauk and Yellowheart. # 15-002. Black Walnut, Hard Maple, Oak and Cherry. 11″ x 11″ x 1″. # 14-40. Hard Maple, Purpleheart and Black Walnut. 8″ x 10″ x 1″. # 14-48. Hickory end grain. 9″ x 10″ x 1″. #14-47. Red Oak, Black Walnut and Cherry. 8″ x 10″ x 1″. # 14-45. Black Walnut, Teak and Hard Maple. 8″ x 10″ x 1″. # 14-44. Jatoba, Hard Maple and Cherry. 8″ x 12″ x 1″. # 14-43. Black Walnut, Hard Maple and Cherry. 8″ x 10″ x 1″. # 14-42. Hard Maple and Black Walnut. 8″ x 10″ x 3/4″. # 14-39. Red Oak, Black Walnut, Padauk and Hard Maple. 8″ x 11″ x 1″. # 14-38. Black Walnut, Teak, Yellowheart and Hard Maple. 8″ x 11″ x 1″. # 14-37. Hard Maple, Goncalo Alves, Black Walnut and Yellowheart. 9″ x 11″ x 1″. # 14-36. Goncalo Alves, Red Oak, Black Walnut and Hard Maple. 8″ x 11″ x 1″. # 14-35. Red Oak, Black Walnut, Hard Maple, Cherry, Yellowheart and Purpleheart. 9″ x 11″ x 1″. # 14-34. Hard Maple & Black Walnut. 8″ x 10″ x 1″. # 14-33. Red Oak, Purpleheart, Black Walnut, Padauk and Hard Maple. 8″ x 10″ x 1″. # 14-32. Red Oak, Black Walnut, Hard Maple and Purpleheart. 8″ x 10″ x 1″. # 14-31. Black Walnut with Yellowheart and Hard Maple inlay. 8″ x 11″ x 3/4″. # 14-30. Red Oak, Purpleheart, Black Walnut and Hard Maple. 9″ x 11″ x 1″. # 14-29. Hard Maple, Purpleheart and Cherry. 8″ x 10″ x 1″. # 14-28. Red Oak, Purpleheart, Hard Maple and Padauk. 8″ x 10″ x 3/4″. # 14-27. Purpleheart, Black Walnut, Red Oak and Hard Maple. 8″ x 10″ x 1″. # 14-26. Red Oak, Purpleheart and Hard Maple. 8″ x 10″ x 1″. # 14-25. Red Oak, Hard Maple, Purpleheart, Walnut and Yellowheart. 8″ x 10″ x 1″. # 14-22. Black Walnut, White Oak and Hickory. 8″ x 10″ x 1″. # 13-01. Cherry, Hard Maple and Black Walnut. 8″ x 10″ x 3/4″. # 14-22. Hard Maple, Black Walnut and Purpleheart. 8″ x 10″ x 3/4″. #14-21. Jatoba, Black Walnut, Honey Locust and Teak. 8″ x 10″ x 1″. # 14-20. Black Walnut, Red Oak, Purpleheart and Hard Maple. 8″ x 11″ x 1″. # 14-19. Hard Maple and Jatoba. 8″ x 10″ x 1″. # 14-18. Jatoba. 8″ x 10″ x 1″. # 14-17. Hard Maple, Padauk and Black Walnut. 8″ x 10″ x 3/4″. # 14-16. Hard Maple, Purpleheart and Black Walnut. 8″ x 10″ x 3/4″. # 14-15. Hard Maple. 7″ x 9″ x 3/4″. # 14-14. Red Oak, Purpleheart, Black Walnut and Hard Maple. 8″ x 10″ x 1″. # 14-13. Hard Maple, Purpleheart and Cherry. 8″ x 11″ x 1″. # 14-12. Black Walnut & Hard Maple. 8″ x 10″ x 3/4″. # 14-22. Red Oak, Purpleheart and Yellowheart. 8″ x 10″ x 3/4″. # 14-10. Black Walnut and Red Oak. 8″ x 10″ x 3/4″. # 14-09. Purpleheart, Hard Maple and Red Oak. 9″ x 11″ x 3/4″. # 14-08. Padauk, Black Walnut, Hard Maple and Red Oak. 8″ x 10″ x 3/4″. # 14-07. Red Oak, Purpleheart and Black Walnut. 8″ x 10″ x 3/4″. # 14-06. Hard Maple, Padauk and Black Walnut. 8″ x 10″ x 3/4″. # 14-05. Hard Maple, Black Walnut, Teak and Mohagany. 8″ x 10″ x 3/4″. # 14-04. Hard Maple, Padauk and Black Walnut. 8″ x 10″ x 3/4″. # 14-03. Red Oak and Black Walnut. 8″ x 10″ x 1″. # 14-02. Hard Maple, Black Walnut and Purpleheart. 9″ x 11″ x 1″. # 14-01. Jatoba, Black Walnut and Hard Maple. 8″ x 10″ x 1″. # 14-23. Black Walnut, Hard Maple, Padauk, Red Oak and Cherry. 10″ x 12″ x 1″.